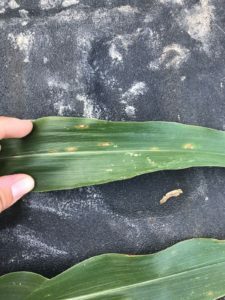 Gray leaf spot, known as GLS, is a disease found in corn. It is a fungal pathogen of cercospora zeae. GLS can be one of the most yielding limiting factors in corn production. GLS connected to the loss of photosynthetic area from leaf blight can result in stalk lodging. 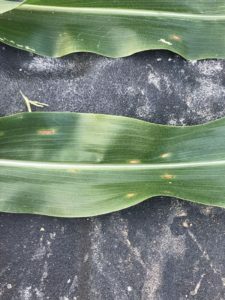 Our EdgeUp Advisors have been spending many hours in the fields and Gray Leaf spot has been prevalent in a lot of corn fields. Call your EdgeUp Advisors with any questions you might have. “With climate field view our EdgeUp Advisors can also scout multiple acres to help give fungicide recommendations. We also encourage our customers to use a curative and preventative combination when making their fungicide selections. Our goal at BA Genetics is to help our farms make decisions that will help increase their profitability.” Said Gregg Adams, Co-Owner of B&A Genetics. The broadest selection of highest quality seed products combined with winning solutions that no one else can offer. ©2019 B&A Genetics, LLC. All rights reserved. B&A Genetics® and its logo design are registered trademarks of B&A Genetics, LLC.